According to the Harvard Business Review ‘Why Most Product Launches Fail’, April 2011, 75% of consumer goods launches from major companies failed to meet expectations. It is well known that 50% of new businesses fail within four years with lack of market acceptance of the new product or service a major contributory factor in many cases. Senior executives bear responsibility for ensuring this key task is undertaken in a robust and professional way. The starting point is the adoption of a benefits-focused process and – less obvious, but just as important - a clear, agreed terminology. 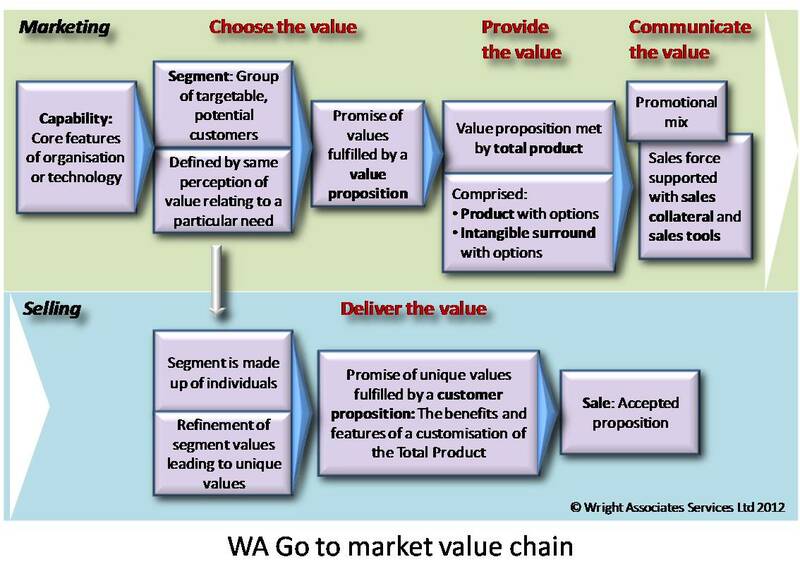 The WA go to market value chain has been developed working with clients over 20 years to do this. The starting point must be a clear understanding of the firm’s capabilities. That is to say the assets it can bring to bear including financial, organisational, operational, marketing and technological. We build on classical marketing theory to define a segment as an identifiable group of targetable, potential customers with a similar perception of value. In this case, individuals or organisations who value what the firm’s capabilities can offer. When the firm’s capabilities are translated of into an offer meeting one or a combination of the value needs of the segment the result is the value proposition. the product surround comprising the services and intangibles that go with the core product including brand, service, warranties, delivery, pre-sales advice, and reputation. Business partnerships are invariably required to deliver the total product. A clear understanding of the value proposition and total product for a segment makes determining the promotional mix internally, or with outside agencies, much simpler. The promotional mix will include consideration of the benefits messages associated with the value proposition, price, communication and delivery channels. The sales force (direct and indirect) then need sales tools, collateral and training to enable them to sell the product effectively. The potential to deliver value can only be fulfilled through a sale. The customer proposition is the total product customised and offered to an individual customer in a particular time and place, becoming a sale on acceptance.